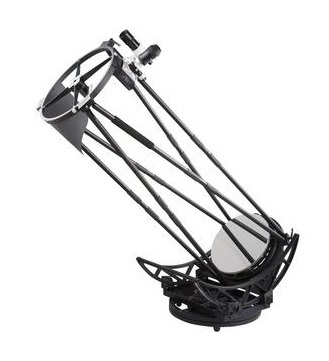 With the new Sky-Watcher StarGate 18, large scopes for all! Dobsons are great “bang for the buck” with their quick setup, simple optics and ease of use. An 8″ Dobson should be everyone’s first telescope; not too big, not to expensive, but with great capability and endlessly upgradeable. Didn’t listen to that bit of wisdom… and now realize my mistake. But one of the drawbacks with Newtonians is that as you seek to dive deeper into space by increasing the telescope size, you quickly reach a point where the optical tube becomes too big to transport. One way to get around this issue is to have a “collapsible” optical tube by using a truss design. When Meade launched the LightBridge series back in 2008 it brought this great concept to everyone’s doorstep. But the largest offered was a 16″ and weighted in a 130 lbs assembled. Going bigger was out of the question. But now Sky-Watcher has addressed the weight issue with a great design and a good choice of materials. The StarGate 18 weighs in at 110 lbs and looks great! The optics are standard F4 Newtonian design: 458mm diameter and 1900mm focal length. The primary mirror is not solid, but designed with ribs to allow for a thinner (and lighter) design, while maintaining rigidity. Even the secondary mirror has cells carved out to reduce weight. The tubes use quick-assembly clamps and Sky-Watcher claims a setup time under 30 minutes. The rocker-designed base with counter weight is a very nice touch, everything sliding on Teflon bearings. OK the $7,300CAD price means it’s not for everyone, but when one considers that a similar sized Ritchey-Chretien astrograph will be over 5x the price, and you still have to find a suitable EQ mount for it, it’s a bargain. This entry was posted in Equipment, News and tagged Astronomy, Dobsonian, Sky-Watcher, Telescope by Benoit Guertin. Bookmark the permalink.